If you don’t live in Chicago, then brace yourself; I’m going to tell you something about this city that you might not know. No kidding. That’s the price we pay, I guess, for excellent pizza, a beautiful skyline, and two Major League Baseball teams that have rolled up a grand total of two championships between them in the last century. Yes, sometimes it snows. Sometimes it even snows a lot, and when it does being a good neighbor takes on a very practical dimension. In Chicago in the winter, good neighbors keep their sidewalks clear. The sidewalks in front of my house and my church, for instance, are part of a popular path to and from the Montrose Blue Line station. (That’s the commuter train, for those who don’t speak Chicagoese.) 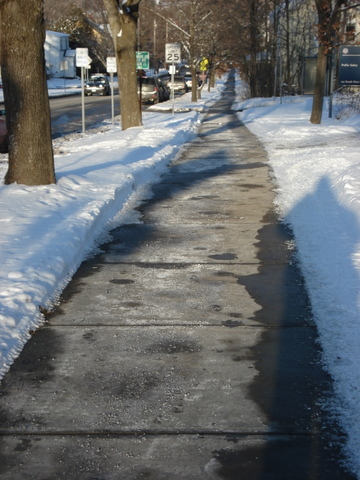 If our sidewalks aren’t clear, people start to notice. I go from being “that nice guy on the corner” to “that idiot who doesn’t clear his sidewalk” in about two days’ time. Clearing sidewalks, though, is pretty straightforward. All you need is a good shovel. A snow blower helps if there’s a lot of snow or a lot of sidewalk, or both. One other thing: you need some salt. Most people use calcium chloride these days, but that’s a salt too. Throw down a little salt and the leftover snow and ice will melt right off. Jesus said those words to people who wanted to be his disciples, who wanted to apprentice themselves to him and learn to see and relate to the world the way he taught. His “salt of the earth” metaphor was, I guess, a way to stress to them that in following him they would make a difference in the world. He wasn’t really telling them to go figure out how to be the salt of the earth. He wanted them to know that if they did what he did and said what he said, their influence would be significant. The difference they made would be tangible and observable. But there’s also a warning there, right? If his followers were to go out into the world without any intention of doing things his way, they would be worthless for the work of the kingdom in the world. People used salt for flavoring food in Jesus’ day, the same as we do. But they also used it — and maybe even most frequently — as a preservative. For us, the preservative nature of salt is sort of behind-the-scenes and not something we pay much attention to anymore. But we have this other use for it that resonates with me, and maybe it will with you as well. I was thinking of it this way recently: we live in a world where relationships between people seem frayed, broken, and adversarial by default. We’re divided along most every line we can imagine. But even those aren’t enough; we even create other lines, other barriers, other reasons to be divided. We’re so divided that our government can’t even function right now. We’re so divided that we have a hard time listening to positions and opinions that differ from our own. We’re so divided that the sight of a red baseball cap or a yellow vest can create pandemonium. We’re so divided that people routinely feel threatened or feared because of the way they look, speak, or dress. How to be “salt of the earth” in a world like ours? Most of the time, I have bags of salt stockpiled and ready to go. You know what? I’ve never heard them saying anything to each other. When I open the bags, the salt inside isn’t much to look at. But as soon as it gets in contact with the snow and ice, things start happening. You can hear it first: loud cracks and pops as the ice starts thawing and fracturing. Then you start seeing pools of water. As soon as that salt gets out onto the sidewalks, it starts to have an effect. That effect isn’t in the salt itself, but in the interaction between the salt and the ice. If it’s true, as we sometimes say, that our churches aren’t having any effect in our world, then that’s a problem that I know how to solve. It’s really very easy and straightforward: get out on the sidewalk. That’s our second option: let’s get in contact with the world around us, with all its hostility and anger and fear and downright hate. Let’s put ourselves out there. Salt has an effect on ice and snow, and if we’ll follow Jesus out into the world I can promise you that we’ll have an effect, too. But maybe the problem is really that we’re just not having the effect we think we’re supposed to have. Listen to me now: Jesus doesn’t make it our responsibility to “convert” people, to “win souls,” to rack up baptisms or commitments to Christ or whatever terms we want to use. When we think that’s the effect we’re supposed to have, we’re going to be disappointed when things don’t work that way. And we’re likely to make the mistake of thinking that we have to be smarter or more persuasive or more attractive, and suddenly it’s all about us. It’s up to us to draw them in, to convince them that we’re right, to win the arguments. And it’s a short hop from there to being just another voice raised to defend just another ideology. Jesus said that salt that loses its saltiness isn’t good for anything but to be thrown out and trampled underfoot. Thing is, of course, that being trampled underfoot is the point for the salt I throw out on my sidewalk. That’s what it’s for. And if we learn anything from following Jesus, it’s that being trampled underfoot might be the point for us, too. That’s frequently how we do what we’re supposed to do in the world: by sacrificing ourselves. By loving those who rail against us, by serving those who see themselves as our enemies, and by responding to hatred, misunderstanding, and misrepresentation with the grace, forgiveness, and compassion we’ve learned from Jesus, we start to thaw the hostility in our world. It makes sense, doesn’t it? Why should our world ever believe that “God so loved the world” if they don’t see his kind of love in us? Remember our function as salt for the earth when you go to work or school. Remember it when you deal with your neighbors. Remember it at church, at community events. Remember it when you post on social media. When you follow Jesus, the energy of the gospel is freed and focused by your loving interaction with the world around you. You can’t help but make a difference in your world, because when you follow Jesus you are the salt of the earth. And through you, Jesus will show the people around you the way to walk.